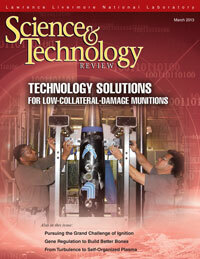 Laboratory engineers apply advanced simulations and technical expertise in explosives and materials to develop low-collateral-damage munitions. Scientists using the National Ignition Facility have made significant progress toward producing a self-sustaining burn of fusion fuel. Understanding how to switch off a critical gene that manages bone turnover benefits efforts to develop targeted therapies for bone formation. Streaming plasmas created by powerful lasers appear to give rise to self-organized electromagnetic fields similar to those found throughout the universe.